Due to rapper Post Malone’s popularity, some students listened to his Homecoming Ball performance from outside of McDonough Field, which reached maximum capacity. Friday evening’s Homecoming Ball reached the maximum capacity of 4,500 people, according to Student Programming Council (SPC) President Tamara Ezzat (18B). “From my experience this has never happened before, and we were delighted that we had high attendance,” Ezzat said. Emily Siegel (18C) said that when she arrived at McDonough Field at about 10:20 p.m., she and at least 20 other students were denied entry, with Emory Police Department (EPD) officers telling the crowd outside the gates that the concert had reached maximum capacity. Siegel said that EPD initially told students to watch the performance from across the street, but eventually let the group watch from outside the field behind barricades. After one student pushed the barricades in an attempt to rush onto the field, police spent the duration of the performance circling around the students in an attempt to ensure that nobody else would try to break in, according to Siegel. For the first time, graduate students had to pay for tickets to the Homecoming Ball due to the Graduate School Government Association (GSGA)/Student Government Association (SGA) split. A total of 100 tickets were available and sold to graduate students, according to Ezzat. GSGA subsidized 50 tickets that were sold for $12, and another 50 tickets that were sold for $16. Emory Emergency Medical Service (EEMS) responded to 11 incidents at the concert, according to EEMS Director Rachel Barnhard. Following the Saturday, Oct. 21, Homecoming Parade, the Plain White T’s headlined Saturday afternoon’s Homecoming concert. Hundreds of students, alumni and other guests attended the event. The Hails opened the concert. The Homecoming Concert was more family-friendly, with various fairground rides and refreshments set up. At various points throughout the performance, Plain White T’s lead singer Tom Higgenson waved to children in the audience. In contrast, Post Malone encouraged attendees to enjoy their recreational drugs of choice. 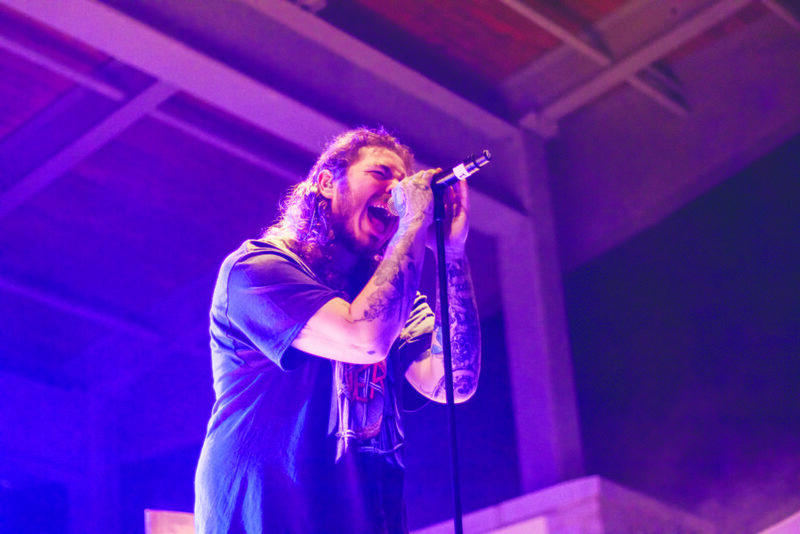 “PCP, weed, crystal meth, cigarettes … you can smoke it,” Post Malone said. Although the Homecoming Ball and the Homecoming Concert differed in atmosphere, both were relatively well-received by students and other attendees. Maureen Ascona (18C) said she was satisfied with Post Malone’s performance. “This is the first concert I’ve gone to as a senior and I was highly pleased,” Ascona said. Anuja Veeraghanta (20C) and Allie Udoff (20C) also said that they enjoyed Post Malone’s performance. “We hope that SPC finds more artists like this because this was the best concert we’ve been to at Emory,” Veeraghanta said. Audience members were similarly satisfied by the Plain White T’s’ performance. Emory alumna Sonal Mathur (17C) said the Homecoming Concert was a good opportunity to revisit Emory and her younger years. “It was just a nice throwback to old music I used to listen to before … [and reminds me of] good times,” Mathur said. UPDATE (10/25/17 at 4:20 p.m.): The article has been updated to reflect an Oct. 25 statement from EEMS Director Rachel Barnhard.